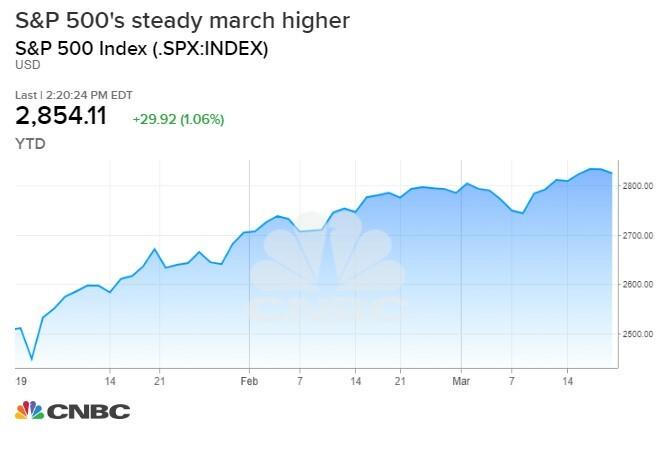 Investors are betting the Federal Reserve alone can keep stock prices higher, especially after Wednesday's monetary policy announcement. The Fed on Wednesday brought down its 2019 rate-hike outlook down to zero. The central bank also signaled its balance-sheet reduction process would end in March. "This is an enormous shift in monetary policy, which we believe is not fully priced into various assets such as risk-on currencies, and Equities, Commodities, and other Value assets," says J.P. Morgan's top quantitative strategist. Corporate earnings are expected to contract in the first quarter and fears of an economic slowdown abound. Yet the U.S. stock market is still up more than 13 percent this year. There is one reason why these opposing scenarios are developing simultaneously: an accommodative Federal Reserve. The Fed said Wednesday it does not expect to raise rates once in 2019, three months after forecasting at least two rate hikes. The central bank also said it expects to end its balance-sheet reduction process by the end of September. Wednesday's news came after the Fed said in January it would be "patient" in raising rates moving forward. For now, investors are betting the central bank can keep the equity market afloat even as corporate profits decline and the economy slows down. They believe earnings don't have to grow all that much this year to justify higher share prices as long as interest rates head back lower. "After this week's Fed meeting, it is clear that the dovish turn is here to stay, and this should be a sustained tailwind for risky assets," Marko Kolanovic, global head of quantitative and derivatives strategy at J.P. Morgan, wrote in a note on Thursday. "This is an enormous shift in monetary policy, which we believe is not fully priced into various assets such as risk-on currencies, and Equities, Commodities, and other Value assets." The Fed's dovish stance is the opposite image of last year. In 2018, the Fed raised rates four times and appeared determined to continue normalizing monetary policy. This brought fear of a potential policy mistake into the market, as the S&P 500 posted its worst annual performance since 2008. This year, investors are cheering the Fed's sharp pivot. 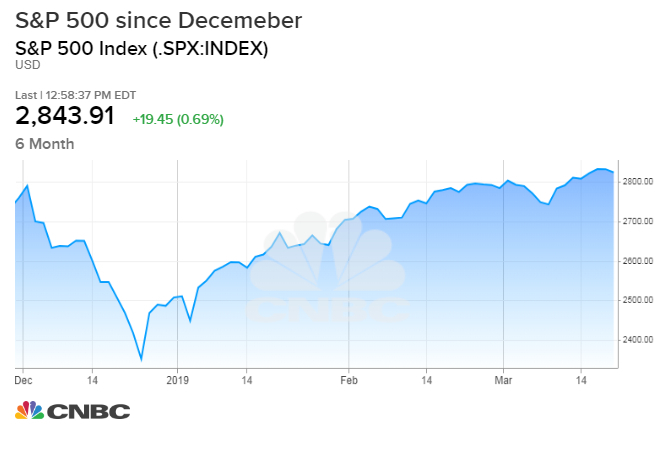 The S&P 500 is about 3 percent below an all-time high set in September after dipping into bear-market territory on an intraday basis back in December. "For now, we think the easing in financial conditions is supporting the US equity market, a prevailing theme for much of the post-[Great Financial Crisis] period," Alex Timcenko, an analyst at Bernstein, wrote in a note Thursday. "Seen in this context, the Q4 equity market decline is not hard to explain; it coincided with a sharp tightening in financial conditions. The subsequent YTD rebound has coincided with an easing in conditions and is also justifiable on these grounds." Can Fed save market again? After the financial crisis, the Fed slashed rates to zero and launched three quantitative easing programs, also known as "QE." This largely accommodative stance helped spark the longest bull market in U.S. stocks history as companies used those low rates to fund expansion and, most importantly, buy back their own stock. The S&P 500 is up more than 300 percent since is post-financial crisis low. Investors have been loading up on Treasurys as the U.S. economic data weakens. The benchmark 10-year yield hit its lowest level in a year on Wednesday following the Fed's announcement. Treasurys are considered a safer investment than equities. Slower economic growth "will make its way into corporate balance sheets. It will be reflected again in corporate earnings," said Komal Sri-Kumar, president of Sri-Kumar Global Strategies. "Previously when that happened, the Fed was able to start a QE2 or QE3 and then reinvigorate corporate earnings. But 10 years after the last crisis, they may not be able to do that trick again." Some companies, including FedEx, UBS and BMW have all issued negative commentary on their quarters and the rest of 2019. FedEx's CFO said earlier this week that "slowing international macroeconomic conditions and weaker global trade growth trends continue." BMW also said it seeks to cut more than $13 billion in costs this year while UBS said the first quarter could be one of its worst one's ever. "It's important to look at what FedEx said and they're saying growth is slowing," said Thomas Thornton, president and founder of Hedge Fund Telemetry. "Stocks are bid higher on this hope for a second-half recovery. I just don't think the Fed is seeing a second-half recovery if they are pausing like this. I think they're seeing some risk and that is with a lot of debt."